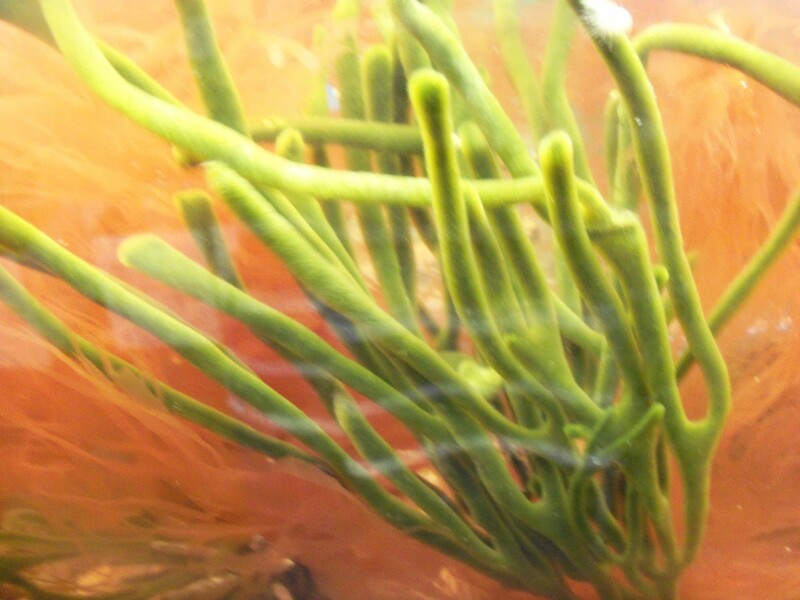 The following is a list of tips on growing the plant and macroalgae species we offer on this website. It should be read in conjunction with our macroalgae care guide. 1. The growth tip, (the very top of the green portion of the seed), must be above the water line. They can be placed in a shallow fuge, sump or nano. If you don't use one of these, push the propagule half way through a piece of styrofoam, until green half is fully through the top portion of the styrofoam, and the red portion is hanging underneath the styrofoam. Alternatively, you can bunch the mangroves together with rubberbands, and add a stick, or similarly shaped object to go lengthwise across the opening in the hood of your tank to hold the mangroves out of the water. We bunch them and place them in front of the heater to cover it up, and make the tank look more natural. 2. 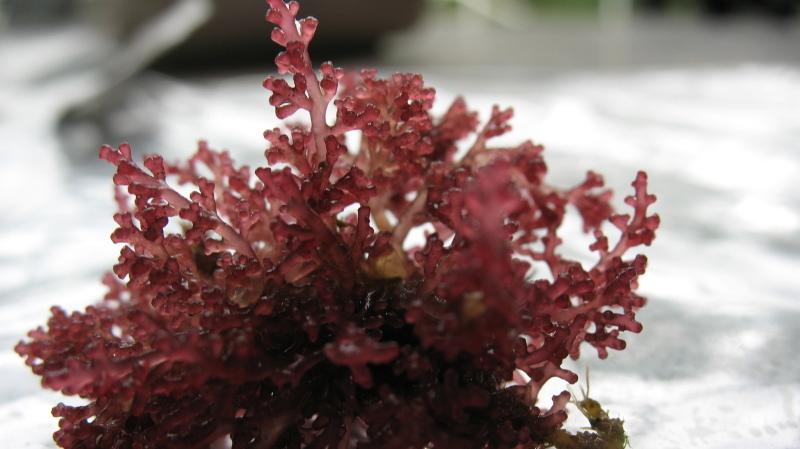 Add light strong enough to grow macroalgae, or a grow light. You can get these at home depot. 3. Heat. Mangroves like warm temperatures, try to keep them in a room that is at regularly 70 degrees or warmer for best results. 4. Misting. Even though red mangroves exclude the majority of the salt in the water, they should be regularly misted to prevent salt buildup. 1. Placement: The propagule of the black mangrove looks like a few leaves bunched together. To get them to sprout in your aquarium, simply place them in the tank, and allow them to float. They will eventually grow hydroponically. 4. Misting. Black mangroves excrete salt through their leaves and require regular misting to prevent salt buildup. Because the black mangrove is a salt excreter rather than an excluder, it is especially important to maintain a magnesium level of 1200 or above when keeping this plant otherwise it way dehydrate because the natural salt removing mechanism is failing for lack of magnesium. Scroll Algae, Padina spp. or Potato Algae are brown macroalgae species that are lightly calcified, the only calcified brown algae genus. In nature it is found in the shallows, often attached to mangrove roots or oyster shell. They grow from a single discernible holdfast and can be attached with superglue to hard surfaces.The holdfast is the name for the bottom of the algae, or the part that attaches to the rock. You should place the algae close to the surface of the tank, in an area with moderate to high circulation after it has been secured to the substrate. This particular macro requires strong lighting compared to other species. The risk of respiration and ph disturbance is lower with this species, compared to most macro algae, but you should always diligently monitor your tank. It also looks great on liverock when a current is pushing against the folds of the algae. Be careful though, many algae eating species of snails, crabs and fish will consume this algae if they have the chance, despite its calcification. Sargassum is a brown macro algae that is common throughout the world, and is a primary habitat of fish and invertebrates in the wild. Sargassum can survive as free floating, or by being held down either by its hold fast, or with super glue. 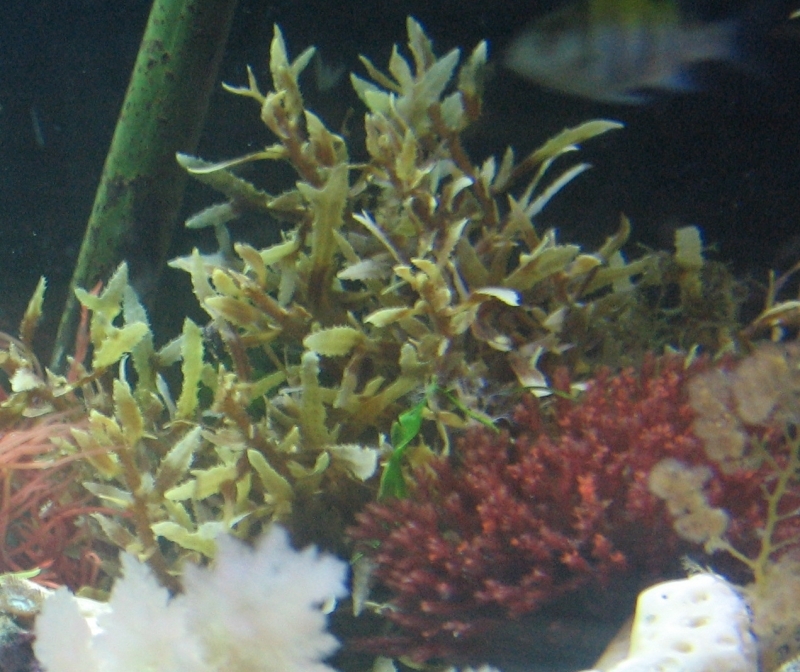 We sell the holdfast species of sargassum, which is easier to keep in the aquarium, and won't tint your water. This particular macro requires medium to strong lighting to thrive. The risk of respiration and ph disturbance is moderate with this species compared to most macro algae, but you should always diligently monitor your tank. I have seen good aesthetic results with sargassum if it is bunched with red algae, or it is placed in a tank that has a fish that enjoys the natural habitat, such as the histrio histrio. We have made cuttings of sargassum in our display sump/refugium by attaching piece of the algae to a tree shaped piece of gorgonian skeleton with great results. Codium is a green macro algae that can be attached to your live rocks or shells with super glue. The holdfast, or the bottom of the algae should be attached. Codium does best within an area with moderate to high circulation after it has been secured in place. This particular macro does not have strong lighting needs. The risk of respiration and ph disturbance is very low with this species. However, you should always diligently monitor your tank. This particular algae looks great on liverock when a current is pushing against the branches giving it a waving appearance. The best time to purchase codium, whether it is tall or short codium is during the early spring or late winter season. Flame Algae (Bryothamnion sp.) is a red macro algae that can be attached to your live rocks or shells with super glue. The bottom of a branch of and individual cutting may be attached. 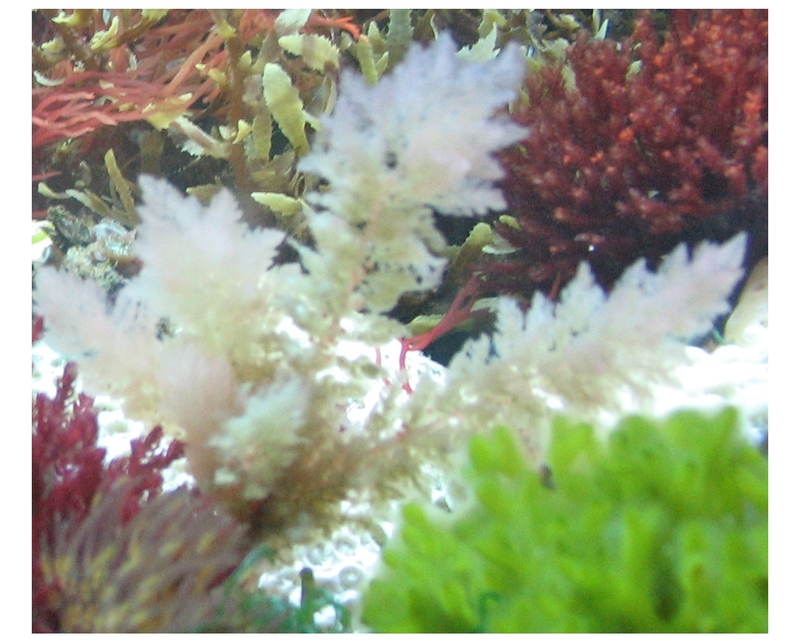 Flame Algae is rigid and does not have high circulation needs, but "dead spots" are always problematic in a tank. This particular macro does not have strong lighting needs. However, the strength of the light will affect its color, as the macro will take on a deeper red under lower light. The risk of respiration and ph disturbance is very low with this species. However, you should always diligently monitor your tank. This particular algae looks great at the base of liverock. Gracilaria is a red macro algae that can be attached to your live rocks or shells with super glue. The runner that is common to the individual branches should be glued. The runner can be cut, and then the individual cuttings can be glued to form new macro algae plants. Gracilaria waves within the water, and should be kept in an area with good circulation for best results. This particular macro does not have strong lighting needs. However, the stronger the lighting the lighter the red, and the less lighting the deeper the red. Gracilaria will grow faster in stronger lighting. The risk of respiration and ph disturbance is very low with this species. However, you should always diligently monitor your tank. This particular algae looks great when attached to the side of liverock. If used as a food for tangs and other herbivorous fish, it should be placed in a refugium. Cuttings should then be made and given to the fish as a treat. 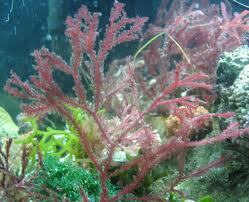 Red Asparagus Algae (Asparagopsis taxiformis) is the most difficult to grow algae we carry. 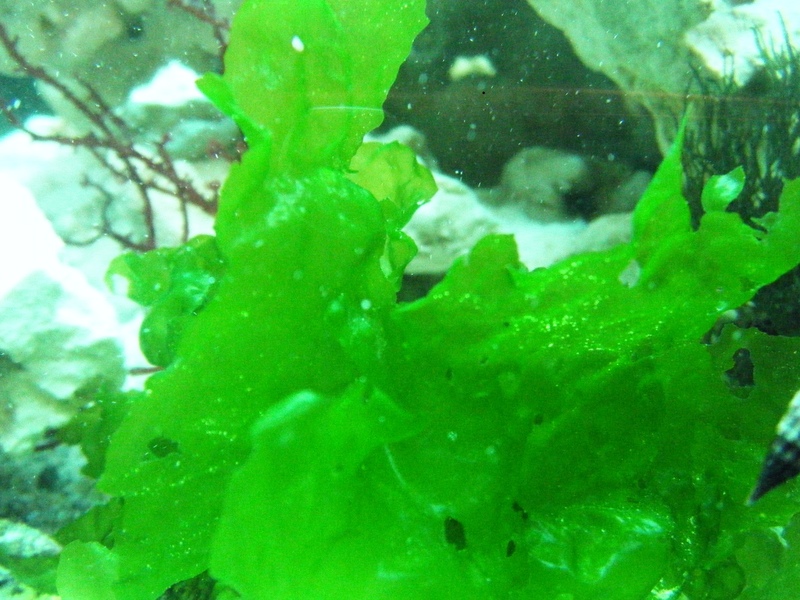 To be successfully kept, this algae must be kept away from herbivorous fish that will devour it, as well as sea hares. It is a fragile macro and must be handled with the utmost care. The holdfast of this macro should be superglued to a hard surface. A limestone based surface is preferred. Without a proper current this macro will simply slump over and wither. It must be propped up to grow. This can be done by placing it so that it slumps in one particular direction. Then a current should be placed in the opposite direction to keep pushing it up. This is how it is usually found in nature, and we have had success with this strategy. Alternatively, you can place it behind a rock and have it pinned against the glass of the back corner of your aquarium, allowing it to slump forward. If enough of the stem is pinned, it will keep the algae bent at a right angle over the rock ledge. 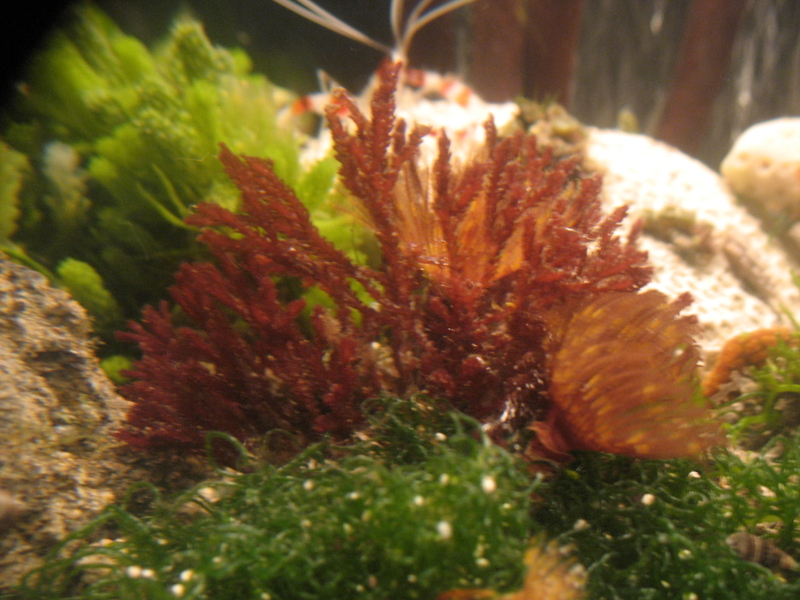 Fire Fern Algae is a red macro algae that can be attached to your live rocks or shells with super glue. 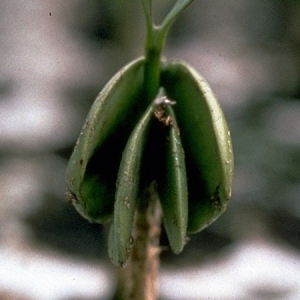 The bottom of a branch of an individual cutting may be attached. 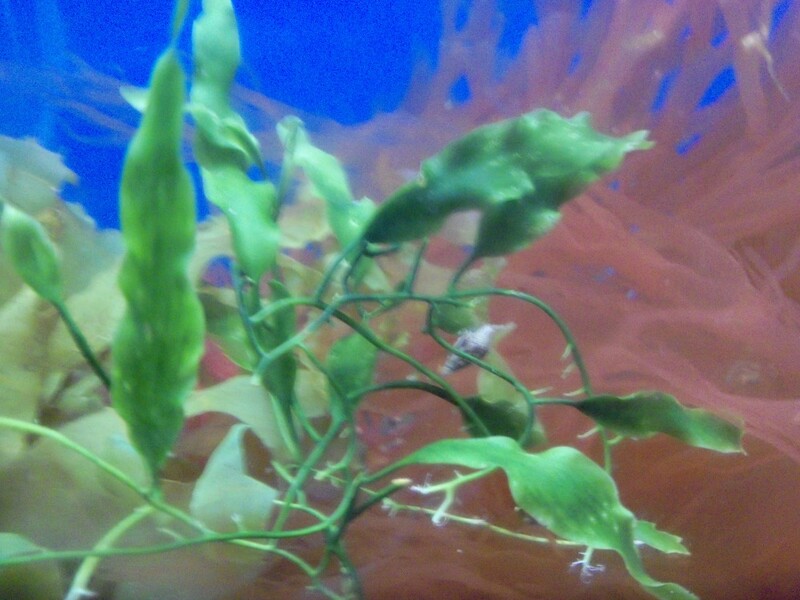 Fire Fern Algae is rigid and does not have high circulation needs, but "dead spots" are always problematic in a tank. This particular macro does not have strong lighting needs. However, the stronger the lighting the deeper the red, and the less lighting the lighter the red. The risk of respiration and ph disturbance is very low with this species. However, you should always diligently monitor your tank. This particular algae looks great as part of the background of your tank. 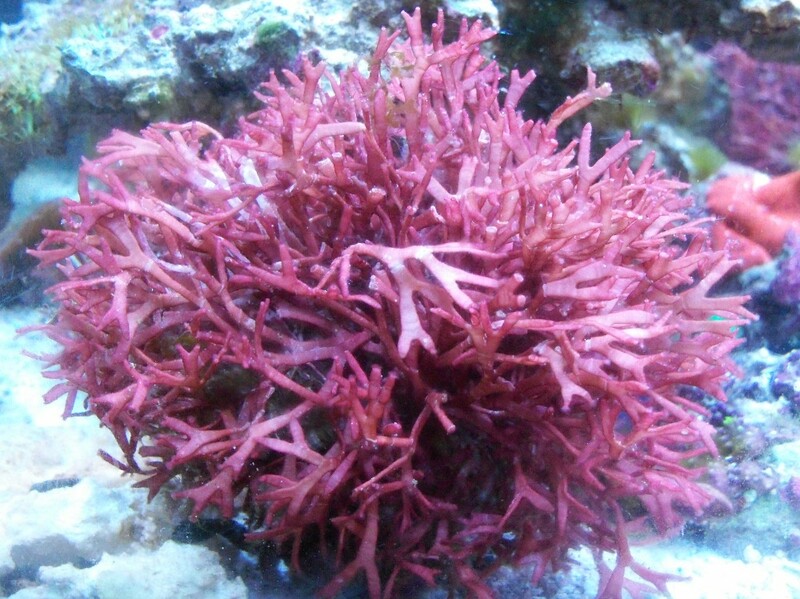 Pink Galaxy (Galaxaura rugosa) is a semi-rigid dome shaped macroalgae that is just incredible looking. Growing to between 3 and 4 inches in diameter it can be attached to any surface in your tank. It is easily kept, requiring little light to survive. With brighter lighting it will take on more of a pinkish color, in 1-2 watts per gallon it will turn reddish. Too much lighting though, and it will start to wither. 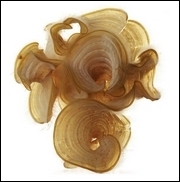 It does not have any specific circulation needs, grows at a moderate pace, and should be kept in your display tank rather that just as a filtering species. While it is not at risk of being devoured by snails, (at least not the kind we carry), herbivorous fish and sea hares may eat this plant. While it is semi-rigid, you should be careful when handling this macro, as you do not want to break a branch and distort the dome shape it grows into. There is very low risk of ph disturbance with this species. Caulerpa is a large genus of macroalgaes that span the globe. We are proud to offer a growing number of species in the caulerpa genus but want you to know the risks associated with these plants. 1. These plants grow quickly, and can overrun your display tank without proper trimming. Because of this they are a better candidate for the refugium, unless you can put in the effort to keep it under control. The Grape Caulerpa and Cactus Caulerpa we carry are less likely to do this than the rest, but they all have this tendency. 2. Of all the macros we sell, the caulerpas present the highest risk of going sexual. In a small system, this can be potentially dangerous. Please read this guide if you are unfamiliar with macroalgae going sexual, or if you want to learn more about this event. 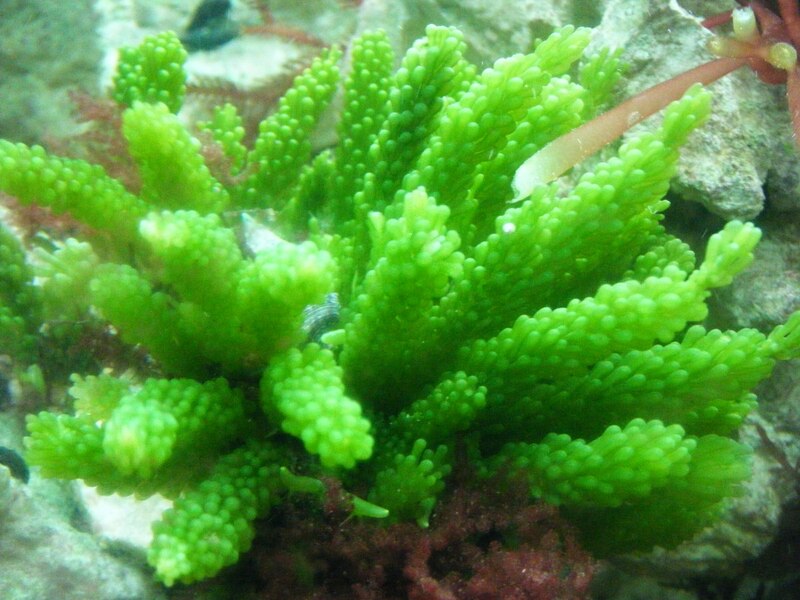 The risk from Cactus Caulerpa is less than the other species of caulerpa we sell. 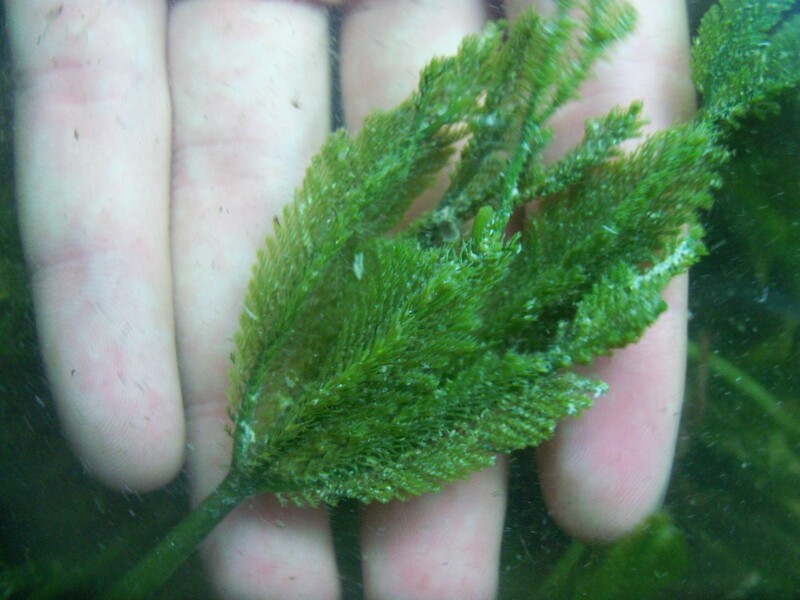 With that said, caulerpa can really add color and variety to your tank, and it is easy to keep alive, requiring only about 2-3 watts per gallon to survive and grow. The runner or root system it grows from can be easily cut to start new plants, and it can be split into multiple plants with ease. It should be attached with super glue, or fishing line to a rock or hard substrate to keep it from floating. In a short amount of time it will attach to the rock, and then the fishing line can be removed. 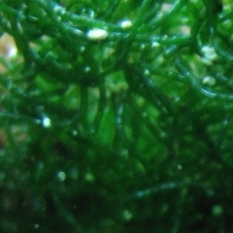 Halimeda is a popular macroalgae because it will not be eaten by herbivorous fish or inverts due to it calcified nature. Members of this genus can be good indicators of the balance between your mangesium, alkalinity and calcium levels, all of which will affect the growth rate of this algae. Depending on the species of halimeda, will depend on where you plant it. Check our product descriptions for information concerning the particular species you are interested in. 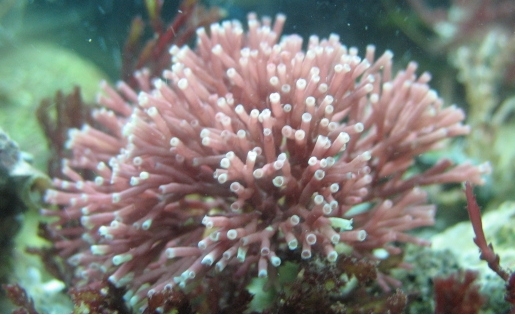 Red Titan Algae (Titanophora sp.) is a red macro algae that can be attached to your live rocks or shells with super glue. The bottom of a branch of an individual cutting may be attached. 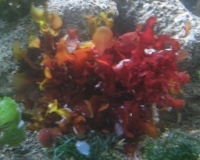 Red Titan Algae is semi-rigid and does not have circulation needs, but "dead spots" are always problematic in a tank. This particular macro does not have strong lighting needs. However, under low lighting it will have orange and yellow tips that give it an "autumn look". Under medium to brighter lighting it will have take on deep red, with only the tips remaining a lighter red. The risk of this ph disturbance is very low with this species. However, you should always diligently monitor your tank. This particular algae looks great as a display piece. The dictyota we sell grows at a moderate pace, and is unlikely to spread throughout your tank. It does well with bright lighting, (about 4 watts per gallon of full spectrum light), and should be attached to a rock or shell. Herbivorous fish may eat dictyota. Ulva is an easily cared for green macroalgae, that can survive extended periods of darkness, (up to a week), fluctuations in temperature and low light. However it will do best under 3 watts per gallon or more, and if it is anchored down to a rock, or shell. You can do this by attaching it with super glue. If you are combinig itwith chaeto for filtering use, or for growing pods, then you should mix it into the chaeto ball so it grows within the chaeto. When you harvest the chaeto, remove the ulva an add it to the chaeto that remains in your tank, as Ulva grows slower than chaeto, and should not be harvested as frequently. No macroalgae we keep is easier to care for then chaeto. Simply place in your tank to your liking, (we like to lay it down as "carpet along the substrate"), put it under 2 watts or better of full spectrum light and you are done. It will grow faster though with 4 watts per gallon or more of lighting on a 14 hour photoperiod. Laurencia poitei is a cartilaginous bushy red macroalgae, with transparent red tinted branches that have knobby tips. It can grow to 3 inches tall and 6 inches wide. It does not require intense light, and can grow easily under 2-4 watts per gallon. Like most red macroalgaes, the lower the light it is exposed too, the deeper the red. The opposite is also true. Laurencia should be attached to survive in your tank. The rhizoidal holdfast on the bottom of the plant, will do well if attached to limestone, aragonite, compacted sand, or even other macroalgaes. It presents a low risk of going sexual in your tank.